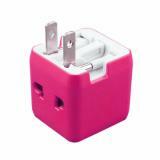 The Mini Travel Adapter is very convenient to carry and can be used in UK/US/EU/Australia. 8 colors for your selection. Apply For: Business, Travel, Gifts and so on. • Lightweight and compact, it is easy for your travel in any countries. • Environmental material, non-toxic, export products flame-retardant standard. • Three-in-one suit, can be used in combination. • Universal US UK EU AU Travel AC Power Adapter. • Universal outlet for plugs of USA, UK, Europe and Australia. • AC USB power adapter with power indicator for easy operation. • Quick links: OTRAVEL SL-176 Adapter with USB. 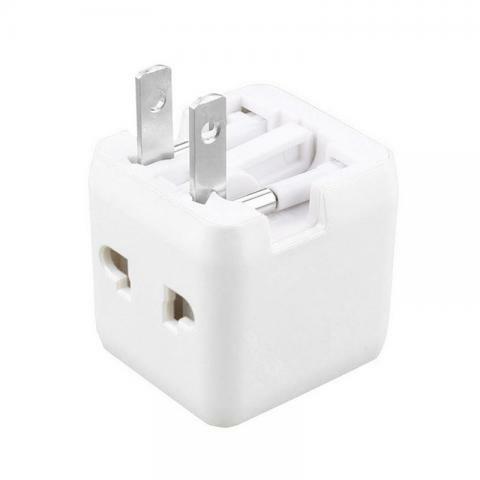 I am planning a trip to Ecuador and needed a connector for my hair dryer and battery chargers. I have not been on my trip yet, but these worked perfectly. I do not anticipate any problem when I get to my destination. I read other reviews that said it was hard to plug the two prongs into the connector. I had no problem once I noticed that one hole on the connector is wider than the other and plugged the two prongs into the connector in the right direction. I love how compact these are compared to our huge travel all over adapter. These are much easier to pack and work well!..Excellent adapters! Very happy with this purchase. Package on time and was packaged well. It looks to be a well designed product and I am anxious to put it to use on our trip. this plug works fine for most cell phones. However, if you're going to use curling irons, hair dryers, etc. with these plugs, you'll need a power converter - a discovery I made after incinerating my curling iron. Did exactly what it was meant to do! I'm from South Africa and go back fairly often. It's amazing how quickly these adapters get "lost." I'll have to buy more before I go next time, since I gave both of mine to a friend studying abroad there right now. These are less bulky and much less pricey than other adapters. I definitely recommend them. It works just fine. It is really large and cumbersome. I know there are smaller models out there.t works just fine.I'll have to buy more before I go next time..Excellent adapters! Very happy with this purchase..Good quality and sturdy. They fit tightly within the socket. The fact that the front openings are covered makes a nice safety feature. So far so good! Delivered in a timely enough manner. I like that each plug notes on the side of the plug which country it is used for so I don't have to look it up or depend on my jet-lagged brain to choose the right one.